A Line Vac Air Operated Conveyor System Really IS Just That Simple. Seriously. A length of hose to get from Point A to Point B. A supply of compressed air. 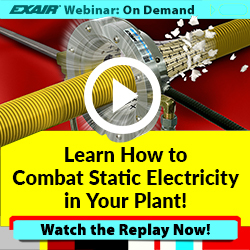 Click here for a great video example of the simplicity of an EXAIR Line Vac Air Operated Conveyor system. This depends on what you’re conveying. Anything in your compressed air supply to the Line Vac can get on (or in) the product passing through. Our Kits include an Automatic Drain Filter Separator, which keeps the air clean & dry. If you need to keep any trace of oil from your product, we’ve got Oil Removal Filters, which can couple right to the Kit’s Filter Separator. Not only do they use a coalescing action to remove any trace of oil, they provide additional particulate filtration down to 0.03 microns. THAT’S some clean, dry air right there. The physical nature of your product. If it can make a combustible mixture with air, we won’t specify a Line Vac. If it’s particularly low density, we’ll discuss the Light Duty models. If it’s abrasive or particularly high density, we’ll go to the Heavy Duty models. If it’s corrosive, we’ve got Stainless Steel. The environment it’ll be used in. If it’s hot (or corrosive, like the product,) we’ve got Stainless Steel. If it’s REALLY hot – up to 900F (482C) – we’ve got High Temperature units. How you want to hook it up. We’ve got Conveyance Hose for our standard Line Vacs…it’s reinforced PVC and is awesome for typical industrial/commercial uses. If you want to use hose with specific properties (food grade, static resistant, high temperature, etc.,) these are all readily commercially available, and are quite commonly seen in successful Line Vac installations. Our Threaded Line Vacs can be used with NPT pipe fittings & connections for more permanent setups. Lastly, the “catch” is ours…not yours. 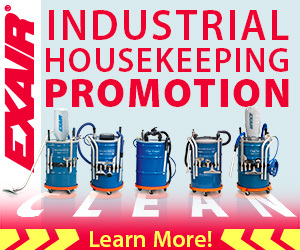 If, after a thorough discussion (mind you, I can talk about Line Vacs all day long…and sometimes I do,) there are still some variables or unanswered questions, we offer all catalog products with a 30 Day Unconditional Guarantee. Try it out – if it doesn’t do what you want, we’ll arrange return for full credit; easy as that. It’s the complete absence of “catch.” Oh, and if you buy a Line Vac before October 31, 2016, you’ll get a free 2″ Flat Super Air Nozzle. If you’ve got a Line Vac – or any Engineered Compressed Air Product – application you’d like to discuss, give me a call.